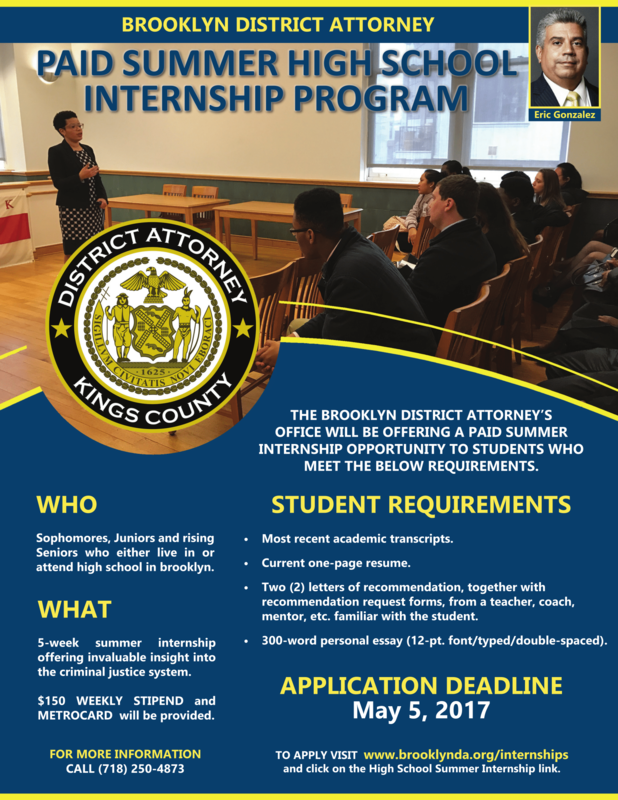 The Summer High School Internship is a hands-on experience that pairs students with Assistant District Attorneys, offering an insider’s view of the inner working of one of the largest DA’s offices in the country. Selected students will be assigned to a unit within the DA’s office and will support the work of Assistant District Attorneys and other members of the DA’s staff. The program is open to qualifying sophomores, juniors and rising seniors who reside in and attend school in Brooklyn. Applicants must be able to commit to the entire duration of the internship, which will run from July 10, 2017 through August 11, 2017, from 9am-4pm, Monday through Thursday, and 9am-2pm on Friday. Students will receive a weekly $150 stipend and a MetroCard. To ensure that every student who has interest has the opportunity to apply, the application deadline has been extended to Friday, May 5th. If there are any issues or concerns, please do not hesitate to reach out to them at (718) 250-4873 or hsinternships@brooklynda.org. Assist with legal research and analysis utilizing various sources such as the internet, news articles, and legal periodicals. Provide assistance to attorneys and support staff at various phases of a matter including pretrial, conference and/or trial. Perform a variety of paralegal and/or clerical functions, as required. Assist attorneys with case preparation, discovery, file maintenance and organization of court documents. Participate in workshops pertinent to different departments and legal zones. Participate in judicial, legal and law enforcement observational field trips. Observe criminal trials and defendants during sentencing in court. 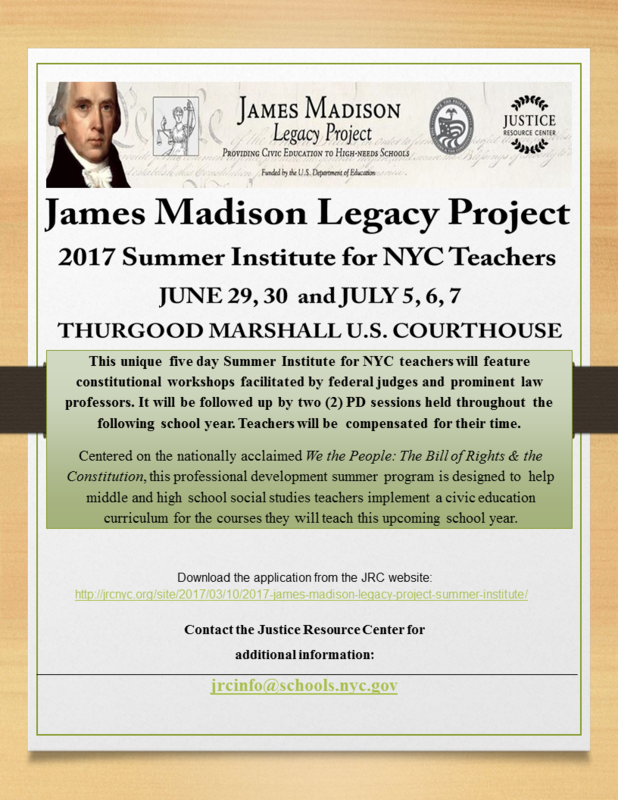 The Justice Resource Center is now accepting applications for the 2017 James Madison Legacy Project Summer Institute! Deadline to apply is June 23rd. This unique five day Summer Institute for NYC teachers will feature constitutional workshops facilitated by federal judges and prominent law professors. It will be followed up by two (2) PD sessions held throughout the following school year. Attendance of all dates is mandatory. Teachers will be compensated for their time. For more details about the program, please click here. Find Per Session Vacancy Notice VC#1110 under the DOE Career Opportunities webpage, or simply download here. To apply, please download the application here and submit to jrcinfo@schools.nyc.gov by June 23rd. The 2017 NYSBA High School Mock Trial Tournament is underway. The Justice Resource Center, NYC coordinator of this premier law-related competition, is currently recruiting volunteer judges. Volunteer judges who are members in good standing of the New York State Bar Association and are also admitted to the New York State Bar for at least two years are eligible for up to three (3) CLE credits for their service. Past volunteers can receive CLE credits once every two years for their service in the Mock Trial Tournament. Please see the application for complete details. If you are interested in serving as a judge, please complete this application and submit to mocktrialjudges@gmail.com or fax to (212) 580-5918 no later than February 6, 2017. 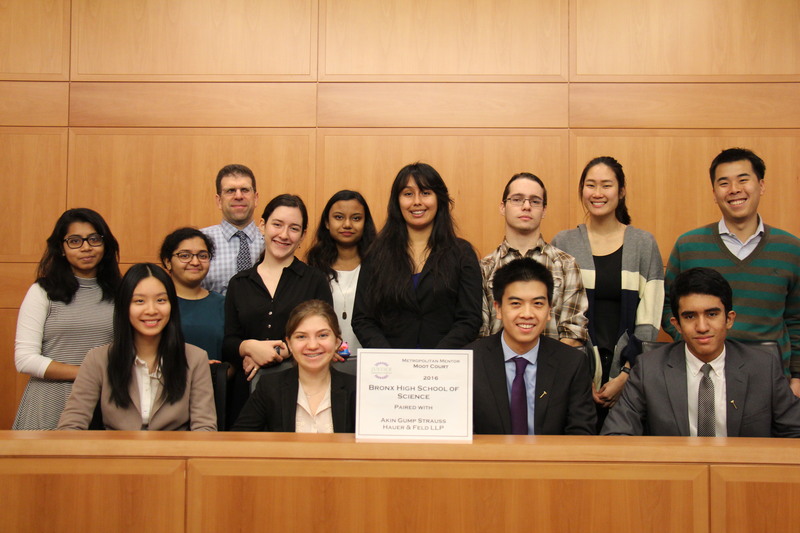 December 15, 2016 – Congratulations to Bronx High School of Science for their victory in the 2016 MENTOR Moot Court Finals! The team competed against Forest Hills High School at the Thurgood Marshall Courthouse on December 15 with five federal judges presiding. Several participating schools, attorneys and educators came to watch as both finalists gave their arguments. Many thanks to all participants this year! 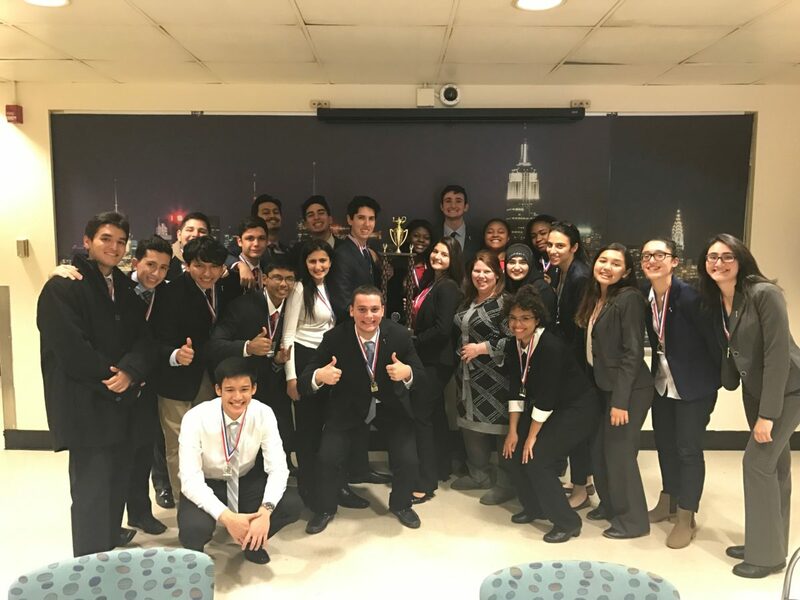 Saturday, December 10, 2016 – Congratulations to Forest Hills High School, James Madison High School, and Townsend Harris High School for earning the top three spots in the 2016 We The People NYC competition! They will be competing in Albany at the New York State Finals in February 2017. This year’s citywide competition was held at MLK High School, hosted by the Justice Resource Center. Classes of students from Forest Hills High School, James Madison High School, Townsend Harris High School, Harry S. Truman High School, Edward R. Murrow High School, and William Cullen Bryant High School presented arguments about the Constitution’s relevance and answered judges’ questions during rounds of mock Congressional hearings. The We the People competition is the yearly culminating event of the NYC program. Teams of students present for four minutes based on the six units in the text. Volunteer attorneys, politicians, and professors serve on the judges panel, and ask students questions for the final six minutes of the competition. Each team is scored based on their overall performance.